In a knock-down, drag-out fight to the wire, Midnight Bisou defeated Escape Clause in a photo-finish to take the $750,000 Grade 1 Apple Blossom Handicap at Oaklawn Park. "She's one of the great ones," said Hall of Fame jockey Mike Smith. "It's an honour to come back here and be blessed to do as well as we've done." In a small field of only six older fillies and mares, Midnight Bisou drew the outside post in the 1m½f test. The last to load in the gate, the 4-5 favourite patiently awaited her turn as attendants scrambled to cajole longshot Viva Forever to load, delaying the start. Escape Clause was away first, followed by Canadian champion filly Wonder Gadot, who shot to the front up the outside under David Cohen and pulled away to lead by three lengths. Escape Clause tracked the pace and slowly gained ground under Tyler Baze, who pushed the filly to maintain a two-length advantage over Viva Forever in third. Advancing to the far turn, Escape Clause came on even terms with Wonder Gadot before passing the filly at the quarter pole to take command. Midnight Bisou, who was patiently handled by Smith, shifted out four wide to challenge the leaders and gave chase. Escape Clause refused to yield and drove hard from her spot on the rail in midstretch. The two duelling fillies pulled away from the rest of the field and battled to the wire. When the photo finish was reviewed, victory fell the way of Midnight Bisou by a nose. "Man, that was great," said Smith. "Escape Clause ran huge, but, you know, the great ones seem to pull it off no matter what. I'm really happy with the way she ran today, but she had to run. Sometimes you have to do that. I sat back with Elate and waited to make my move. She ran huge, she had to fight for it, but she ran big. Escape Clause ran really well." It was another two and three-quarter lengths back to third-place Elate, who finished nine lengths ahead of Viva Forever in fourth. "She's really and truly probably one of the best horses I've ever been on in my life," said Baze of Escape Clause. "She gives it her all. She got beat a nose, and I got slammed pretty hard going into the first turn. I knew I got beat at the wire. It was a head-and-head battle all the way down the lane. She gave me everything. We were a little unfortunate we didn't get the bob." The win was especially poignant for Smith, who earned his seventh Apple Blossom score. His previous wins came aboard Zenyatta (2008 and 2010), Azeri (2002-04), and Nine Keys (1994). Midnight Bisou kicked off 2019 with wins in the Grade 3 Houston Ladies Classic on January 27 at Sam Houston and then the Grade 2 Azeri Stakes at Oaklawn on March 16. 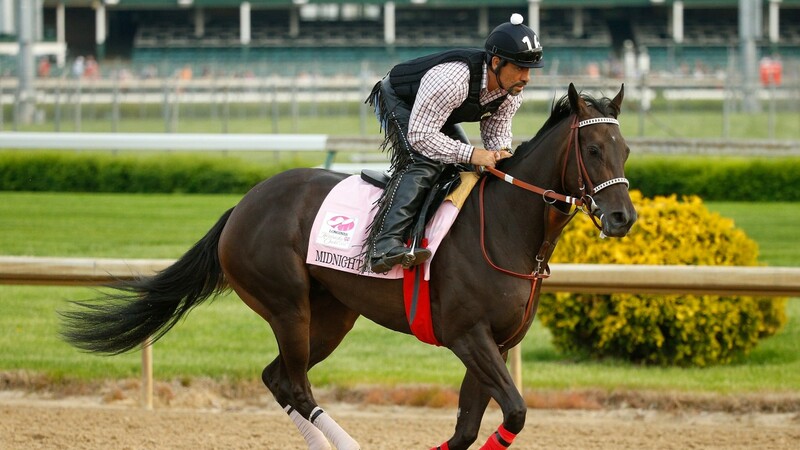 "What an unbelievable filly," said Asmussen. "We were talking about what a special filly she is, how much confidence she has this year. She really seems to be enjoying her job. We're just blessed to have her." She ran huge, she had to fight for it, but she ran big.